Sustenance Artisan Foods’ flavour of the month for January is ancient grain granola. A classic blend of ancient grains like amaranth, quinoa, millet and superfood seeds like chia, flax and pumpkin, lightly sweetened with organic honey with hints of cinnamon and sea salt. 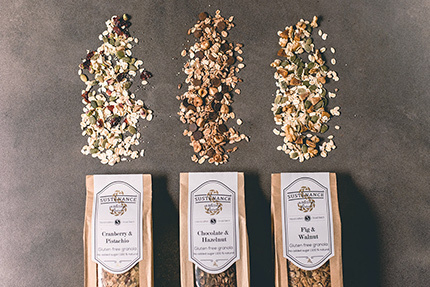 The handcrafted granola by Sustenance, founded by Richa Talwar, is gluten-free, packed with nuts and seeds, 100 per cent natural and sweetened with locally-sourced organic honey. Each batch is hand-mixed and baked in small batches at low temperatures to give it a crunch and toasty flavour. Its gluten-free, vegan, 100 per cent natural and refined sugar free makes it a healthy choice for the whole family. These crunchy granola clusters can be enjoyed with milk, yoghurt, on top of a smoothie, ice cream or salad, or straight out of the jar.